As far as directing powerhouses of the 1960s, Andrew V. McLaglen will never be remembered as one of the greats. He started off in television before making the jump to feature film, teaming several times with John Wayne while also specializing in audience friendly “guy movies.” Good guys versus bad guys, lots of familiar faces and situations, you know the formula. One of his best? 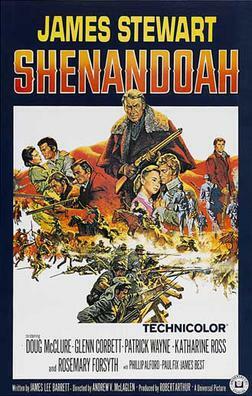 An underrated Civil War drama, 1965’s Shenandoah. It’s 1864 in Virginia, and the tide of the Civil War has turned as the Union forces are slowly beating down the Confederate armies. Doing his best to remain free of the bloody fighting, farmer and patriarch Charlie Anderson (James Stewart) wants nothing to do with the war. Both for himself and his family — seven kids, one daughter-in-law — Anderson simply wants to keep working his 500-acre farm and get through the war unscathed. Fight for Virginia? Fight for slaves he doesn’t have? He fights for what he believes in, his family and his farm. Well, that’s what he’d like to do. While the fighting rages on, Charlie is stunned when he finds out his youngest son (Phillip Alford) has been confused as a Confederate soldier and captured by nearby Union forces. Now the war and the fighting that Anderson has done so well to steer clear of has landed square on his front porch. Can he find his son amidst the hell of war? This was a movie I watched often growing up when my sister and I had sleepovers with my Grandma. It made an excellent Civil War double feature with Friendly Persuasion, and let me tell ya, they both hold up! I watched this McLaglen-directed Civil War drama for the first time in years, and it resonated just as much now as an adult as it did when I was a kid, if not more. McLaglen had some excellent movies to his name — The Wild Geese is a favorite, Hondo, McLintock are also excellent — but this is his best movie overall. The story is a series of very effective, often moving and often disturbing vignettes, all held together by the Anderson family. Filmed on-location in Oregon and California, ‘Shenandoah’ is an underrated visual film, and the musical score from composer Frank Skinner is a gem. So what stands out viewing this one as a 32-year old, not a 13-year old kid? That would be James Stewart, one of my favorites in just about any movie he’s in. This doesn’t get the attention or notoriety as one of Stewart’s best performances, but it certainly belongs in the conversation. I love what he does with the part of Charlie Anderson, a stubborn, feisty Virginia farmer and widower looking out for the best intentions of his family. He doesn’t care about the war, about slavery, about Union and Confederate. He will do anything, ANYTHING, to protect his family. Stewart has some great scenes with the younger supporting cast, especially Alford’s youngest son, only called ‘Boy,’ with his daughter, Jenny (Rosemary Forsyth), daughter-in-law, Anne (Katharine Ross), and his sons. There are too many memorable, emotional scenes to mention, but my favorites are the most simple. Minutes before the Andersons go to church each Sunday, Charlie visits his wife’s grave and just talks to her. Simple perfection, Stewart absolutely nailing the underplayed but charged scenes. Stewart is the unquestioned star of McLaglen’s film, but ‘Shenandoah’ offers quite the ensemble of recognizable faces. Glenn Corbett and Patrick Wayne play Jacob and James, the two oldest brothers. Corbett especially stands out as Jacob who’s beginning to question if their choice to stay out of the war is the right decision. Wayne is solid too, especially in his scenes with Ross. In her film debut, Forsyth is excellent, a subtle scene-stealer as innocent, tough and thoughtful Jenny who’s also interested in a young Confederate soldier, Sam (Doug McClure). The other Anderson boys include Charles Robinson, Jim McMullan and Tim McIntire. Maybe the best thing you can say about the story is that the family dynamic, it just works. You believe them as one cohesive unit, one that stands together through thick and thin. But wait, there’s more! Also look for George Kennedy as a sympathetic Union officer, Gene Jackson as Gabriel, a friend of Boy’s, a slave, Paul Fix as the local doctor, Denver Pyle as the pastor, James Best as Carter, a fellow prisoner who takes Boy under his wing, Harry Carey Jr. as another Confederate prisoner, Tom Simcox as Lt. Johnson, a Confederate officer, with Kevin Hagen, Dabbs Greer and Strother Martin also playing small but memorable parts. So 32-year old me certainly picked up some new things, or at least was able to process things differently. This is one hell of an anti-war flick. The portrayal of the latter stages of the Civil War is unsettling and often times, disturbing. Death awaits around every corner, hiding behind every tree. The lines are up in the air as the war takes a turn toward its ultimate conclusion. A late battle between a small Confederate camp and a larger Union force with heavy artillery is quick and awful and uncomfortable, one of the more underrated battle sequences I can think of. The last half hour especially features one kick in the gut after another that truly hammers home the anti-war message. And that last scene? Pretty perfect, the possibility of hope lingering in the air amongst all this pain and suffering and death. One of my favorite movies. This entry was tagged 1960s, Andrew V. McLaglen, Denver Pyle, Doug McClure, George Kennedy, Glenn Corbett, Harry Carey Jr., James Best, James Stewart, Patrick Wayne, Paul Fix, Strother Martin, The Civil War. I like a lot of McLaglen movies, pretty standard flicks that are nonetheless highlly entertaining. Wild Geese is an action classic if you ask me, and just because of the subject matter, Shenandoah deserves classic or near-classic status. Thanks, Mike!